Of course I love working at new venues all the time and I know there are TONS of wonderful venues around that I've yet to experience, but I wanted to take the time to list some of my favorite venues in the area. These are places I know and trust, and can recommend to any bride looking for a quality experience with a trusted owner and/or team who will care for your wedding day as much as you do! Rustic outdoor wedding venue and Bed & Breakfast near Bloomsburg, PA. The outdoor possibilities paired with bridal party accommodations create the perfect Wedding Weekend package. Whitewoods is a beautiful venue nestled in the heart of PA, surrounded by towering pines, cozy cottages and a babbling brook. Natural landscape, rustic decor, and well- appointed accommodations. Nuptials, Shindigs & Bashes in an enchanted stone barn nestled in the rolling hills of north central Pennsylvania. Aside from your venue, your wedding dress is probably one of the BIGGEST decisions you can make for your wedding day! Here are some recommendations for my favorite bridal boutiques in Pennsylvania and along the East Coast! Serving the Wilkes-Barre, Scranton, and Williamsport markets and beyond, Exclusively You carries a wide selection of wedding dresses and formal wear for a truly unique shopping experience. Lancaster's premier destination for bridal gowns that match each brides' unique style. Luxury is found in a warm welcome and an exceptional experience. We are a nationally-recognized, full-service bridal salon that features exclusive international designs. Since outdoor weddings, DIY weddings, backyard weddings, and barn weddings are some of my favorite weddings to shoot, rentals and styling are a big ticket item for many of my couples. The right rentals and some fabulous styling can make a backyard wedding look like a boho masterpiece straight out of a magazine. Here are my top picks for wedding rental companies and styling teams in the heart of Pennsylvania! Vintage. Modern. Eclectic. Character Infused. Turning blank spaces into creative spaces. Boutique rental company located in downtown Tunkhannock , PA. Our amazing collection of props, furniture, tableware and decor helps make any event beautiful! Wedding rentals in Selinsgrove, Sunbury, Lewisburg, Danville and beyond, offering farmhouse tables, candelabras, chandeliers, mismatched chairs, arbors, drapes, chiavari chairs, table settings and more. Let's talk FOOD! Food is such a huge, personal decision when it comes to the wedding planning process. Do you want a backyard barbecue feel, a family style Italian meal, or upscale food options that look like pieces of art? Food can set the tone for the wedding day and leave your guests raving about your wedding day for years to come! Lucy's is the area's premier catering company serving as the exclusive hosts the beautiful, multi-room facility at Rolling Pines. We are also proudly offering full service catering off-site. We service the Bloomsburg, Berwick, Danville, Lewisburg, Hazleton and surrounding areas. The Epicurean Delight Catering Co.
wo brothers and a passion for great food.... In 1982, Cliff & Dave Daniels started The Epicurean Delight Catering Company in Falls, Pennsylvania. If you have been seeking a unique catering service with dynamic, unusual and vibrant cuisine, your search is over. Relaxed fresh from the farm style catering, barbecue, pig roasts and more from the family at Ard's Farm! Wedding planners and coordinators can help your wedding day run like a well oiled machine, and can take so much stress off your plate! Imagine what your day would be like if you could just relax the weekend of your wedding and allow someone else to do the heavy lifting. Well, you can! Wedding planners & coordinators come in all shapes and sizes. You can hire someone to help you throughout the entire process, providing recommendations on other vendors, or you can hire someone to just coordinate the day of your wedding. Hand-stitched celebrations in Pennsylvania & beyond. Everyone loves a good party and I am here to help you plan and execute one to remember! The world is made up of love stories; it's our job to tell yours! Event planning and coordination company passionate about providing personalized service for each client. I love flowers. You'll find them all over my Instagram as soon as my peonies start showing up in late May and all of the gorgeous wildflowers in Pennsylvania are what my dreams are made of. Here are my favorite local florists to work with! Event florist that specializes in weddings. Owners Thomas and Elliot Hoy serve as lead designers and consultants. The naming of the business was very deliberate as we take great pride in every aspect of our craft and look forward to working with you to create your vision. Growing sustainably since 2010 in Pennsylvania’s Central Susquehanna Valley, we create bouquets, boutonnieres, corsages, and centerpieces with our own flowers and greens. We also craft garlands, floral crowns, pew-end adornments, and almost anything else you can imagine. If you’re a DIY’er, we’re happy to provide buckets of flowers and greens to create your own arrangements. Professional Hair & Makeup can totally make your wedding day experience that much more fabulous. Choosing the right team to complete your look is so important! Here are my top recommendations for Hair & Makeup artists in the Central & Northeast PA areas. Offering both in spa and on-site hair & makeup for your day, you can rest easy knowing Venus is there to help you look and feel your best on this day. Depending on the wedding, DJs, bands, and string quartets are all types of music you might be considering for your big day, and they have a HUGE impact on how guests perceive your wedding day. They can keep guests entertained for hours with a packed dance floor, or they can put guests to sleep (cue the early shuttle bus departures). 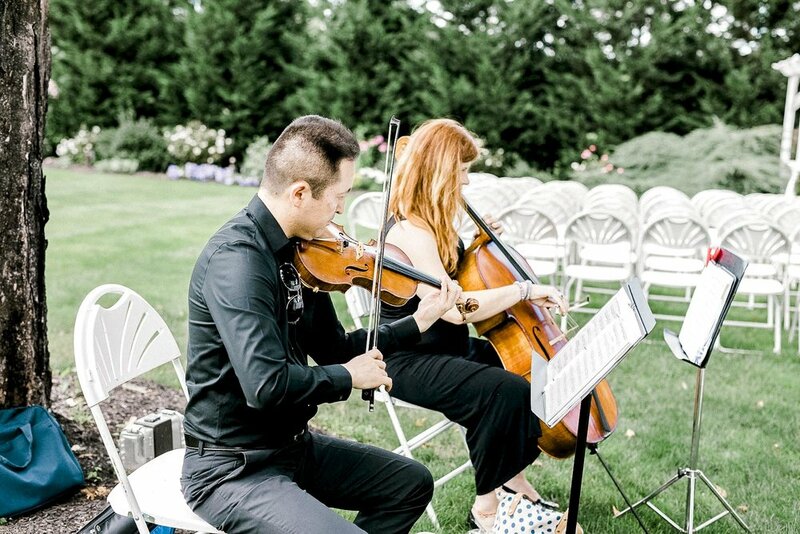 Here are some of the best names around in Northeastern Pennsylvania, Central Pennsylvania, the Poconos and Lancaster/Philadelphia areas, to help you pick the perfect music for your wedding day! Elegant, live string and jazz ensembles for your wedding, event or special occasion. With over 40 years of combined experience, we are available for a wide range of events in Northeastern Pennsylvania, Wilkes-Barre, Scranton, the Poconos, the Lehigh Valley, Philadelphia and beyond.